Entry rules for the Miss Wales pageant are "outdated" and breach the Equality Act, it has been claimed. Sarah Sweeney, of the Women's Equality Network (WEN) Wales said entry rules were "not fit for the 21st Century". Organiser Paula Abbandonatto said she wants to create a "feminist army" and sees it as her "duty" to empower the contestants. Ms Sweeney, project officer at WEN Wales, said: "There's dual discrimination where you treat women unfavourably because of pregnancy and because of their age and this obviously sends out negative messages to women and girls all over Wales. "As a feminist organisation, we aren't in favour of this type of competition, but we understand and respect a woman's choice to enter a beauty pageant such as Miss Wales." The 22-year-old said the final had been a "celebration of who we are". 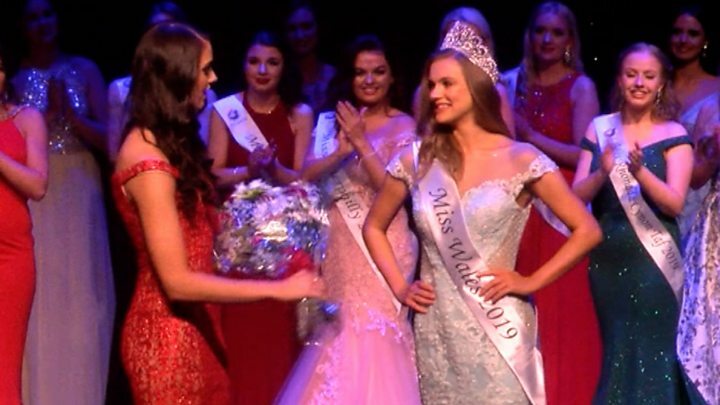 Contestants this year raised funds for the Miss World charity Beauty With A Purpose, as well as taking part in the International Women's Day #BalanceforBetter campaign. Ms Abbandonatto said she wants to create an army of feminist role models "parading around Wales, showing girls how to live their best life". She said contestants are given an empowerment workshop and the competition is a "journey in personal development". She added: "It wouldn't take a lot of Googling to find a pageant for every age, every shape, every size. So we're not the only one. If you want to be in a beauty pageant you can be, whether you're married or not." Speaking at the time, Miss Morgan said it had been a "great strain" but "had to come out in the open".